As a well-established company with a long history of providing customized solutions all along the manufacturing continuum, Crossroads Industrial Services remains committed to employing people with disabilities and generating income that is used to support rehabilitation services for children and adults through EasterSeals Crossroads. At Crossroads, our focus is on ability. We take pride not only in our training programs, but also in matching each employee’s abilities with projects that will bring out his or her strengths in order to consistently exceed customer expectations. Every member of our Crossroads family has a unique story to tell, and when you partner with us, you become a part of that story. 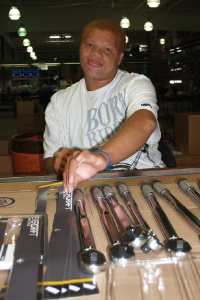 Crossroads Industrial Services is a proud part of AbilityOne, a Federal program that creates employment opportunities for people with disabilities at nonprofit agencies that manufacture and sell products and services for the Federal government. The goals of the AbilityOne program align with the Crossroads vision to promote honest and transparent business processes while remaining committed providing superior product and service quality. Our qualifications and proven processes make Crossroads perfectly positioned to be exactly what you need in an outsourced manufacturing partner, with the added benefit of helping us give back to the community. Supported by NISH (National Institute for the Severely Handicapped), AbilityOne is the largest employer of people with disabilities, with over 47,000 people employed nationally in 2012. In order to be designated as an AbilityOne provider, 75% of the direct labor of an organization’s work force must be performed by employees who have some form of a disability, including our wounded warriors. Crossroads takes pride in matching a person’s ability to meet customer opportunities. Meet Evelyn: Evelyn is a multi-skilled worker at Crossroads Industrial Services. She takes great pride in doing her job well and contributing her skills where they are needed, which makes her a very versatile employee.